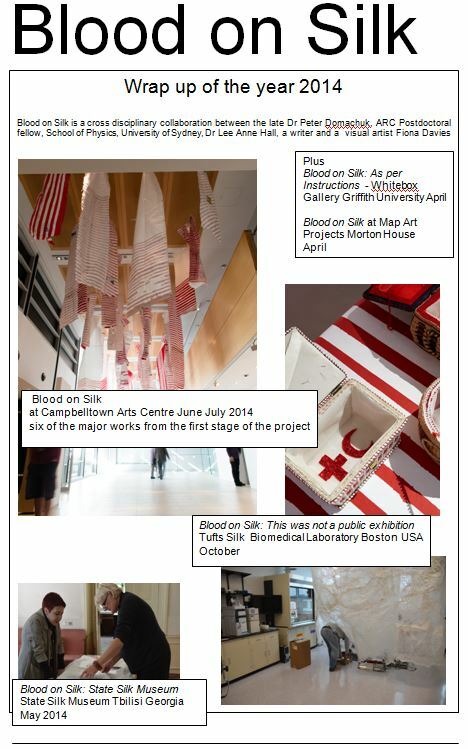 Monash University Magazine, Delivering Impact – Blood lines spelled out. This was an idea I saw proposed a year or so ago. Great to see it is in practice. Anything that reduces the possibility or unintentional error has to be a good thing. Damien de Courten, scientist at Dept. of Neonatology, University Hospital Zurich, shows Glucolight’s measuring head with the smart membrane. Photo: Empa. 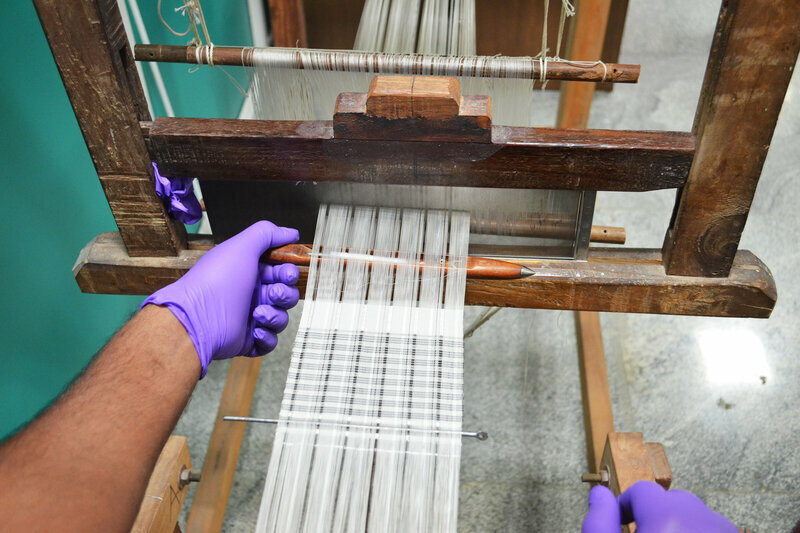 Using a simple wooden handloom, weavers create silk strips that diabetics can use as glucose sensors. This loom is at Achira Labs in Bangalore, India. 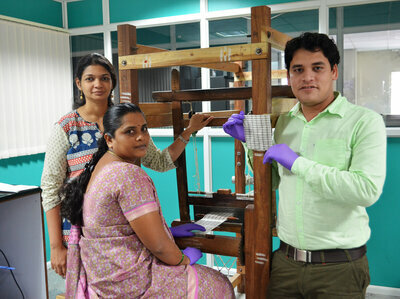 Sobha (center) is one of the weavers who turn silk into test strips. To her right is Tripurari Choudhary, a design engineer at Achira Labs. To her left is Mithila Azad, a company director. And the cost is lower. Right now, a box of 100 paper or plastic strips costs about 1,600 Indian rupees or $25. A box of silk strips will cost one-third to one-quarter of that, says Mithila Azad, director of Achira’s fabric diagnostics division, which has developed the fabric sensors over the last 18 months. The price point is especially critical in India, which has the second highest number of diabetes cases in the world – 66.8 million – behind China. A low-income Indian family supporting a diabetic relative may spend up to 25 percent of its income on care, according to the World Health Organization, while a similar family in the U.S. might spend around 10 percent. The strips also create new ways for women weavers to earn money. The weavers who work for Achira are pumping out 100,000 strips every six hours using a traditional handloom. More weavers should soon be joining them. Last summer, Achira began scouting for a way to weave and distribute the strips in low-income communities. The company teamed with the Working Women’s Forum, which helps marginalized women with handicraft skills, like silk weaving, start small businesses. This spring, thanks to a $100,000 grant from Grand Challenges Canada, the team will recruit women to open five weaving hubs in rural and suburban towns across Tamil Nadu, a southeastern state where one in 10 people have diabetes. The weavers will run each hub, manufacturing and distributing the silk strips in their communities. “Any weaver can make it. That’s the beauty. It can give a boost to the small-scale weaving industry,” says electrical engineer Siva Vanjari of the Indian Institute of Technology, who isn’t involved with the project. But don’t look for silk test strips in U.S. pharmacies. The high price of importing silk means that in the United States, the fabric will likely be reserved for scarves and stockings. Can we move past an ethnographic approach to Arts/Science ? One of the common artistic strategies that appears to dominate the current batch of arts /science exhibitions is the practice of the artist finding or making an artefact of science; either in the laboratory, from a real or online scientific archive, or in the collection of a science museum, and then re-locating it to an art exhibition. Simply stated, moving the artefact to an art space or art museum excises it from its original context and locates it within the discourse of art not the discourse of science. Using the parallels offered by debates around ethnographic museum practices of collection and interpretation, the artist can be seen simply as a collector acquiring artefacts from ‘other’ sites or discourses with different languages, cultures and contexts. The artefact in this process is then interpreted by its location in a privileged art space as being within the discourse of art removed of its original context. These colonial type practices are increasingly unacceptable but not extinguished within the ethnographic museum arena .